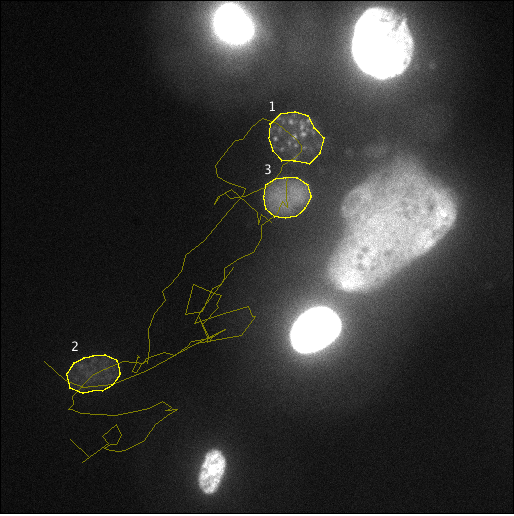 This ImageJ plugin (CGE) is a semi-automatic tool to detect and track moving cell, and to measure the fluorescent protein expression level. CGE extracts the trajectory of the cells by tracking their displacements, makes the delineation of cell nucleus or whole cell, and finally yields measurements of various features, like reporter protein expression level, cell displacement. D. Sage, M. Unser, P. Salmon and C. Dibner, "A software solution for recording circadian oscillator features in time-lapse live cell microscopy", Cell Division 5:17, 2010. 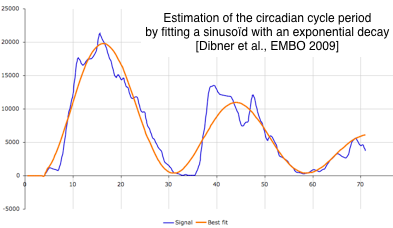 C. Dibner, D. Sage, M. Unser, C. Bauer, T. d'Eysmond, F. Naef, Ü. Schibler, "Circadian Gene Expression Is Resilient to Large Fluctuations in Overall Transcription Rates," The European Molecular Biology Organization Journal, vol. 28, no. 2, pp. 123-134, January 21, 2009. Circadian biologists are applying time-lapse microscopy using fluorescent reporters to study individual cell oscillation pattern. 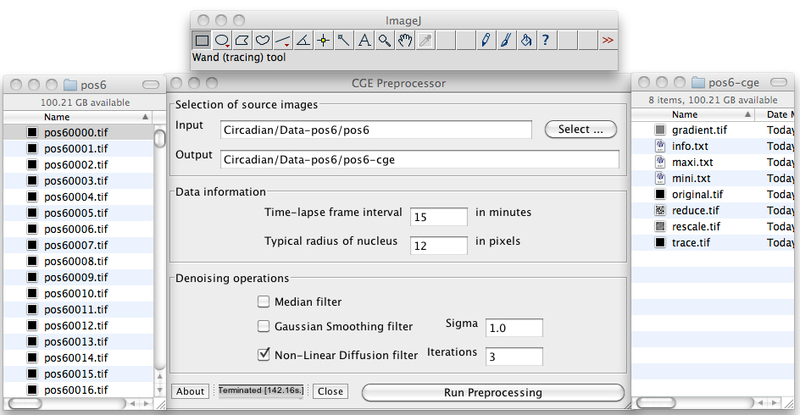 In an attempt to improve existing methodology of time lapse microscopy analysis for such experiments, we developed this ImageJ plugin, called CGE. It is a semi-automatic tool to detect and track moving cell, and to measure the fluorescent protein expression level. CGE extracts the trajectory of the cells by tracking their displacements, makes the delineation of cell nucleus or whole cell, and finally yields measurements of various features, like reporter protein expression level, cell displacement, and granulometry index. In spite significant circadian variations in protein expression with extremely low expression level at valley phase, this software allows recording accurately and efficiently large number of cells parameters. 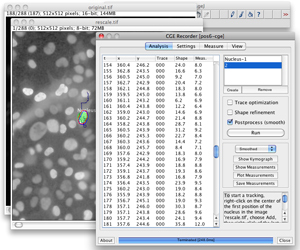 The software provided here is a plugin for ImageJ, a general purpose image-processing and image-analysis package. It runs also on the image-processing package Fiji. ImageJ has a public domain licence; it runs on several plateforms: Unix, Linux, Windows, and Mac OS X. It doesn't take more than a couple of minutes to install. 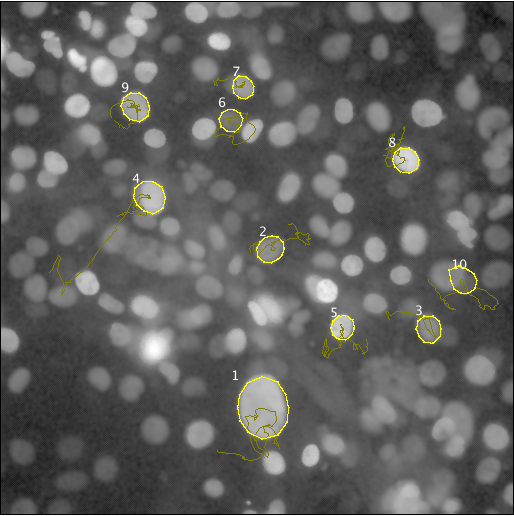 Download CGE_.jar, the ImageJ's plugin. The plugin consists in one single JAR file; place it into the "plugins" folder of ImageJ. Do not unzip the JAR file. 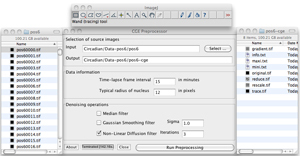 The software package CGE consists in two ImageJ plugins. The preprocessing plugin CGE_Preprocessor is applied only one time to the image sequence. It precomputes all data required for the recording. It is highly computational and can required several minutes for a sequence of few hundreds images. The recording of the gene expression over time is performed by the second plugin CGE_Recorder. This plugin uses the data produced by the first plugin and interact with the user to quickly determine the trajectory and the outline of a nucleus. Select a folder contains the sequence of images. 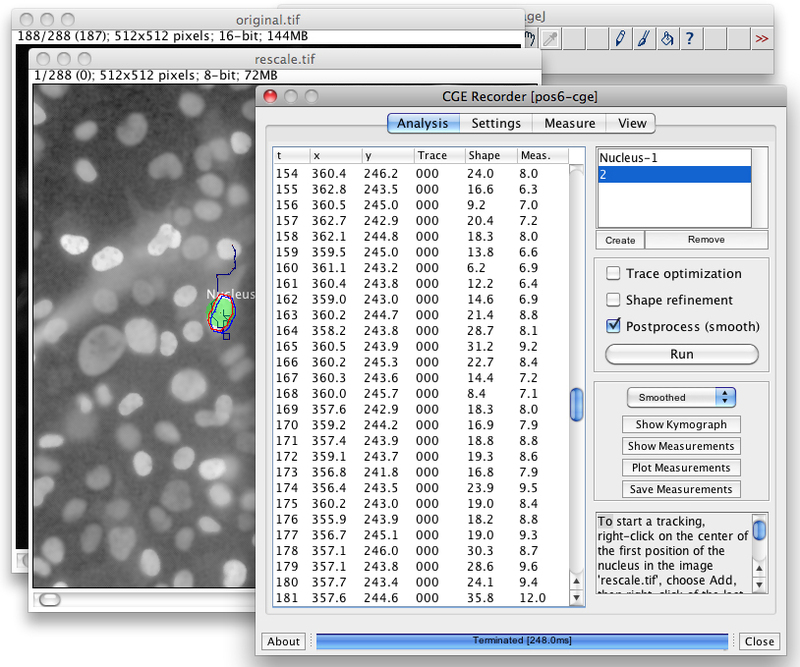 Give the time-lapse frame interval in minutes and the typical radius of a nucleus (object to track) in pixels. Select the appropriate denoising operations. The choice of this operations and the parameters depends of the quality and of the level of noise of the input images. Click on the "Run Preprocessing" button. At the end, the preprocessing plugin generates a folder named with a "-cge" suffix. This folder contains the preprocessed sequence of images. The data of the folder will be used for the second plugin CGE_Recorder. Launch the plugin CGE_Recorder, menu Plugins » CircadianGeneExpression. Select a folder named with a "-cge" suffix. Two stacks are laoded "rescale.tif" and "original.tif". Create a new trajectory by clcik on the button "Create". Double-click on the name of the trajectory allow to rename the trajectory. At the beginning there is alreary one existing trajectory called "1". Define the trajectory of a nucleus by clicking on its center and choosing "Add". Select at least two time position to create a trajectory. The trajectory is computed by a optimization procedure (dynamic programming) when the checkbox "Trace optimization" is checked or it is computed by spatio-temporal linear interpolation when the checkbox "Trace optimization" is unchecked. Better results is obtained by adding several positions, specially when the nucleus is closed to other ones or when the level of the nucleus is close to the background level. The optimization procedure for the tracking has a cost function expressed of a sum of 4 terms: the absolute and the variation of intensities and the absolute and the variation of the displacement. The optimization procedure has two constraints the maximum displacement from one the next frame (in pixels) and the confinement area (in pixels). Choose "Run" to start the shape outline detection. The detection of a nucleus is perfomed used the active rays technique, the number of rays (or vertices) is a parameters of the algorithm (see the "Settings" panel). Checking "Shape refinement" could give more accurate results but it highly computational. Checking "Postprocess (smooth)" applies a Gaussian smooth of the results, position and shape, the level of this regularization is set by three parameters in the panel "Settings". This prostprocess tends to reduce the number of false detection. The measurements are performed during the outline of the nucleus. Three zones of measurement are defined as percentage of the detected outine. Zone 1: internal area of the nucleus, the percentage should be less than 100%. Zone 2: periphery area of the nucleus, the percentage should be greater than 100%. Zone 3: outer area of the nucleus, the percentage should be greater than 100%. The plugin has two mod to evaluate the background level 1) It could a uniform background for all the nucleus, this uniform background is estimated at the beginning of the plugin, but the background can also be entered manually (see the "Measure" panel). 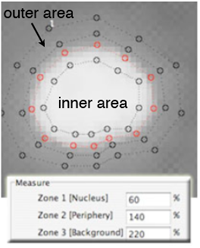 2) The background can be computed individually for every nucleus has the mean intensity of the zone 3 (outer). In the plugin CGE_Recorder there are several options to visualize the results. Show all results in table. Show some results in a graphical plot. Save all measurement in a CVS file. This file is stored in the folder "-cge". After saving the results, take your favourite spreasheet to plot the results you want.